I chose this short passage from Soke Hatsumi’s writings to help illustrate a point, in many, many classes there is almost too much safety and softness in the training. How can one prepare to face real combat when the floor is so padded that it is like a pillow to fall on. More to the point when there is no contact, you never sweat in class, or even that you have never been bruised, again I ask what kind of training is that? 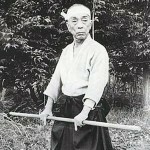 I have over the years never been in a really safe environment when training, my heroes when I was a boy were Mas Oyama, Bruce Lee, Chuck Norris, Bill Wallace, Soke Hatsumi and many other warriors who trained with a ferociousness and intensity to teach them to endure pain and come out the other side smiling. I can tell you long stories of training in ninjutsu, and the crazy things I, my teachers and my students have done and still do, but the reality is you need to take your training to a new level, to progress through your fear of pain, and come out the other side still smiling, knowing you have given your all in training to learn to protect yourself in the real world. In the next few posts I will be continuing on in more free lessons to help you get to the next level in your ninjutsu practice. 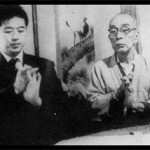 In a previous post I wrote about the importance of ukemi in your training, here is a quick story about Soke Takamatsu during his travels and adventures in China. 1) “Greatest importance to be able to roll correctly in as many different ways as possible” , so true in many ways. In your training practice on a variety of surfaces, add obstacles and learn to control the direction of your roll, tumble or fall, as well as be able to change direction and or stop on a dime. 2) Note: that he rolled, grabbed a weapon then leapt to decapitate his opponent. Here again is a more advanced lesson to add to your training. Place tools/weapons on the training area fllor dive, roll, fall then grasp them and in a seamless flow, throw, engage your opponent, roll to a new location etc. Make your ukemi alive here! One of my favorite pass times is throwing projectiles of all types. Shurikens, blades, tomahawks, and so many other items just because. Well, my son and I were practicing the other day and it reminded me of earlier practices were my students and I would run , dive, roll, and throw shurikens etc. at a variety of targets. Throws were done in the air, after the roll or from the fallen position. Well just another thing to keep in the training program!